I suppose no-one really noticed but here in Switzerland almost half of the bee colonies died this winter. It’s an alarming figure – 100, 000 colonies, due to the Varroa mite which has had such a devastating effect due to the general weakened immune system of the native honey-bee. Einstein said that when the bees die we have four years left to live. We don’t really know exactly for what the bees are responsible other than pollination but even then, such a catastrophic decline must alarm even the most materialistic of thinkers. This reminds me of a story I once heard, that since over 20 years in a very remote province in China, an interesting spectacle takes place. The entire population, who rely incidentally on pears for their economic prosperity, climb up the fruit trees when they blossom in spring and collect the pollen with wooden rods on which chicken feathers are tied. The pollen is then dried and brought back up to the blossoming tree in order to ensure pollination. 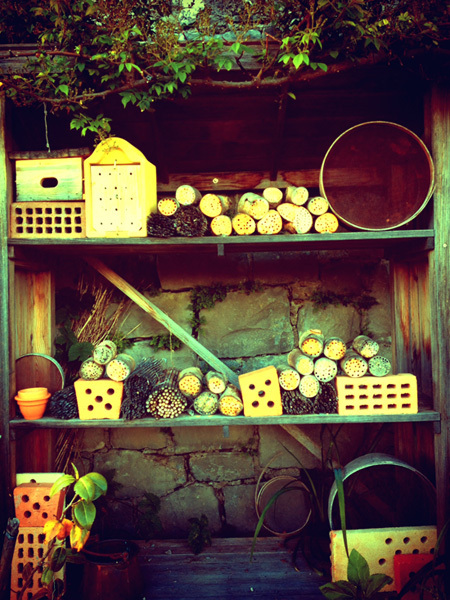 I believe in lighting candles instead of complaining about the darkness and that’s why for years I’ve put up insect hotels (some of them 5* like the above) to welcome special guests here in the garden.